15K Pull Rite SuperGlide now available on Industry Standard base rails. The only fully automatic slider design that allows RV'ers to JUST DRIVE! SuperGlide hitches provide fewer hassles, greater towing safety with less accidents. If you are already using a 5th wheel hitch, PullRite's new 15K Pull Rite superglide 5th wheel hitch is designed to fit your existing rails. It will fit most 'industry standard' rails, such as Reese, Curt, Husky and RBW. Just remove your existing hitch, drop in the 15K Superglide hitch and install a capture plate on the 5th wheel pin box. 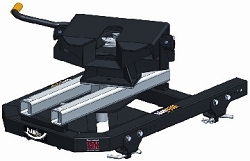 The hitch is adjustable front to back to ensure proper placement above the rear axle when towing. The Pull Rite 15K Superglide automatically moves up to 14 inches while making a turn - 50% farther than manually adjusted slider designs. PullRite's automatic locking gear driven rotary latch is the best latch design ever. It gives you a quieter, safer towing without all the noise, bumping, chucking, hassles and problems of straight slide bars and other lesser hatch designs. This also reduces the danger of dropping your 5th wheel trailer. The latch wraps around the king pin and locks automatically.. How it Works: The trailer king pin box is fitted with a capture plate, which engages the head of the hitch, so that when, during a turn, the hitch's head twists to stay in line with the trailer. As the head twists, the patented CamGlide feature moves the head back away from the truck cab..